Manvinder Rattan was born in Nairobi, Kenya and moved to the United Kingdom with his family when he was two. He has lived most of his life in Woodford Green in Essex where he went to Churchfields Junior School and then Ilford County High School for Boys. Manvinder’s family was not particularly musical but excellent music teachers cannot fail to inspire. In this case, Francis Roads and Ian Gorman. Manvinder started playing the cornet at the age of seven, moving on to French Horn when he was 11. He still enjoys playing the recorder and can’t remember a time when he wasn’t singing. Manvinder read French and History at The College of Ripon & York St John where he was a Choral Scholar. As part of the scholarship, the College paid for Manvinder to attend his first conducting course with Sing for Pleasure; his life has not been the same since. Under the inspirational leadership of James Wild, the course was to have a profound impact on Manvinder’s life. Sing for Pleasure delivers very high quality teaching giving participants a strong foundation of key conducting skills on which they build according to their own abilities. But music wasn’t his intended career and Manvinder joined John Lewis as a graduate trainee in 1989 in Sheffield. There. he sang with the Cathedral choir before moving to Portsmouth where he also sang with the Cathedral Choir. A move to John Lewis Watford brought his first contact with the John Lewis Partnership Music Society, first as as performer and then, from 1995, as its Musical Director, initially in addition to his role as a selling manager, and from 2006, as his primary role in the company. In 1994, its single choir gave two performances a year; now with over eight choirs around the country, activity has grown hugely. Manvinder established The Cavendish Singers, an award-winning chamber choir, and The Cavendish Ensemble, voted one of London’s top five amateur orchestras in 2009 by Classical Music magazine. Find out more about the John Lewis Partnership Music Society here. Manvinder Rattan enjoys delivering singing workshops around the country; seeing people sing when they always believed they couldn’t is something he finds very fulfilling. He has been known to have a roomful of self-perceived non-singers singing in four part harmony within 30 minutes. 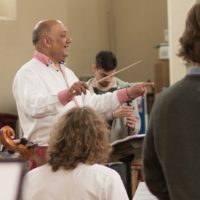 Having completed his training as a choral conductor with Sing for Pleasure, Manvinder joined the charity’s tutor team and assumed the role of Head of Conductor Training in 2006. The courses are accredited by the ABRSM: Sing for Pleasure last year taught over 250 conductors whose feedback on the standard of tuition was rated at 95% Good to Excellent. Sing for Pleasure also trains orchestral conductors at the start of their orchestral conducting training. Manvinder studied choral directing with James Wild, John Coates, Jill Henderson-Wild, Peter Erdei and Laszlo Heltay. He studied orchestral directing with Colin Metters, John Farrer and Neil Thompson. Manvinder has performed and conducted in most West European countries: Rome, Venice, Florence, Athens, Lyon and Barcelona are some of the cities where Manvinder has performed with one or more of his ensembles.